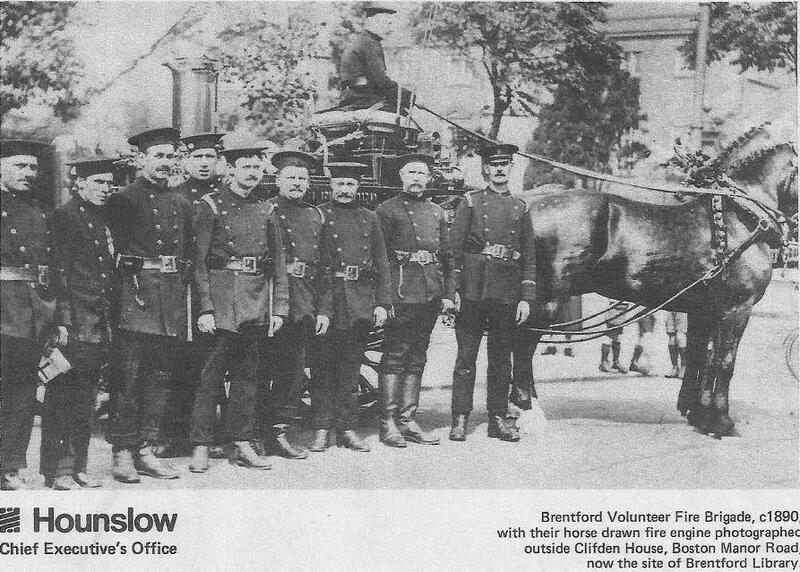 Thanks to Pauline Stanhope (nee Young) for this photo taken around 1890 showing the Brentford Volunteer Fire Brigade. It is from an old calendar and shows ten men with a horse-draw fire engine outside Clifden House. Brentford Past provides additional information: The brigade was formed in 1868 and housed its fire engine at the Ham until the fire station by Ferry Lane was built in 1897. This station closed in 1965 when the new fire station at Chiswick opened, but the building still remains. You will find several other fire brigade photos under fireman in the occupations page, also names of the volunteers in 1879. There is more information about the Ferry Lane fire station.